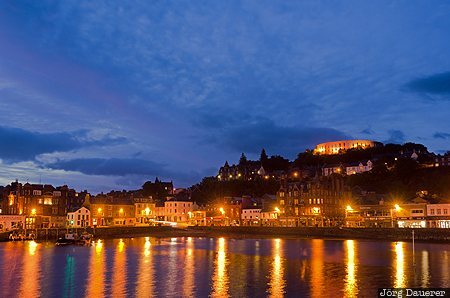 The houses of Oban and the flood-lit McCaig's Tower in the background and their reflexions in the Firth of Lorn at the blue hour just after sunset. Oban is in Scotland, United Kingdom. This photo was taken in the evening of a sunny day in June of 2013. This photo was taken with a digital camera.